Google+ Mom to 2 Posh Lil Divas: Snowflakes, Snowflakes All Around! Faux Tie Dye Coffee Filter Snowflakes & More! Snowflakes, Snowflakes All Around! 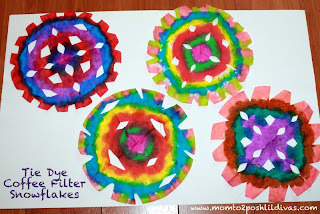 Faux Tie Dye Coffee Filter Snowflakes & More! There is just something about cutting snowflakes that never gets old. 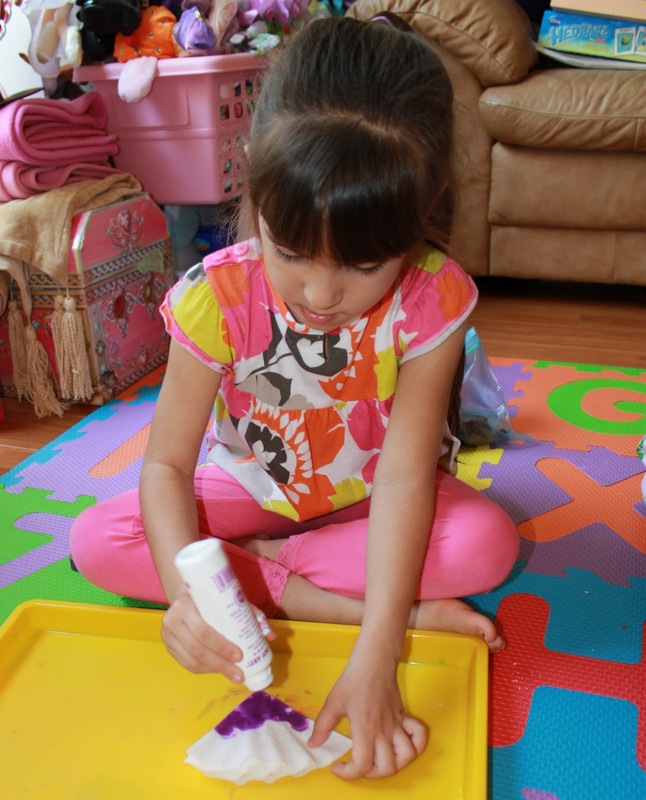 it is still exciting to create your own snowflake masterpiece. so this year I thought it would fun to change things up a little. 2. Using dot markers/bingo daubers make a pattern on the coffee filter. Be sure to cover both sides completely. this makes it easier to cut without ripping them because they won't be so wet. 4. Refold & cut your design into your snowflake. These look fabulous on our window!!! 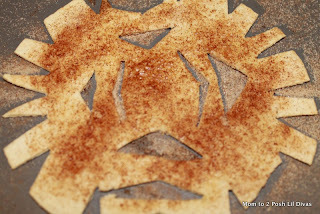 yummy, fun & easy cinnamon sugar tortillas as a quick snack. 1. Fold a tortilla in half & then half again. 3. Melt a little butter and brush onto tortillas. 4. Sprinkle with cinnamon sugar to liking. 5. Pop into the oven at 350 degrees for 5-7 mins. 6. Allow to cool a bit & then enjoy! A quick, easy & fun snack that kids can help you make. Let me know how it goes! I'd love to see yours! Beautiful! Love how you used bingo markers! Fab idea! Thanks! 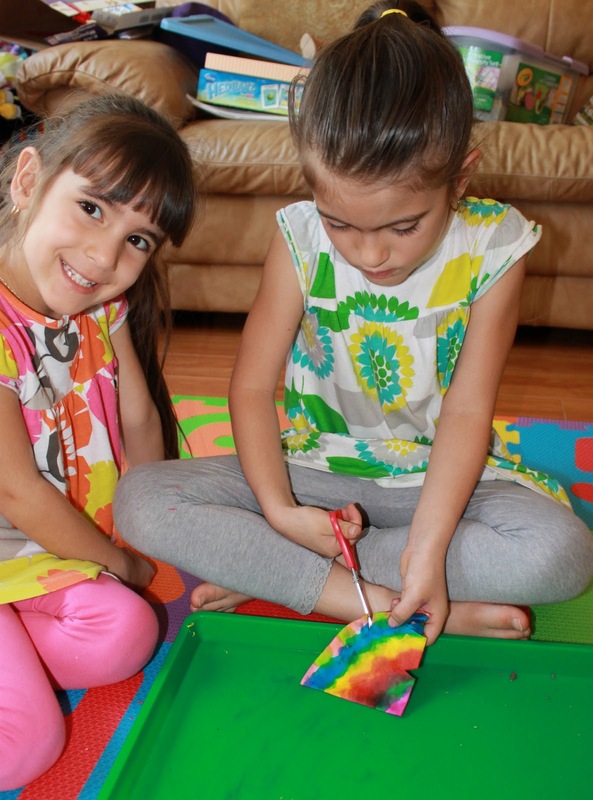 My girls LOVE bingo markers & they get a kick out of this faux tie dye - it's so exciting to them to reveal their masterpiece at the end. What lovely snowflakes! I love their bright colors! Thank you! They look so bright & colorful on our windows! What a creative idea - I never would have thought to make snowflakes out of tortillas! I made them with my 3 year old for snack time today, and my girls loved them. We also tie-dyed our coffee filters, and we'll cut them out tomorrow. Thanks for making our day more fun! YAY, Marcie! Thanks for making my day with your sweet comment! So glad you were inspired to try it out and enjoyed it. Be sure to share your finished tie dye project - I'd love to see. Thanks for the ideas. We are making the coffee filter ones today and will be sure to link back to you! Tortilla snowflakes... almost like churros! What a great idea. I am making them with my cooking club in school!